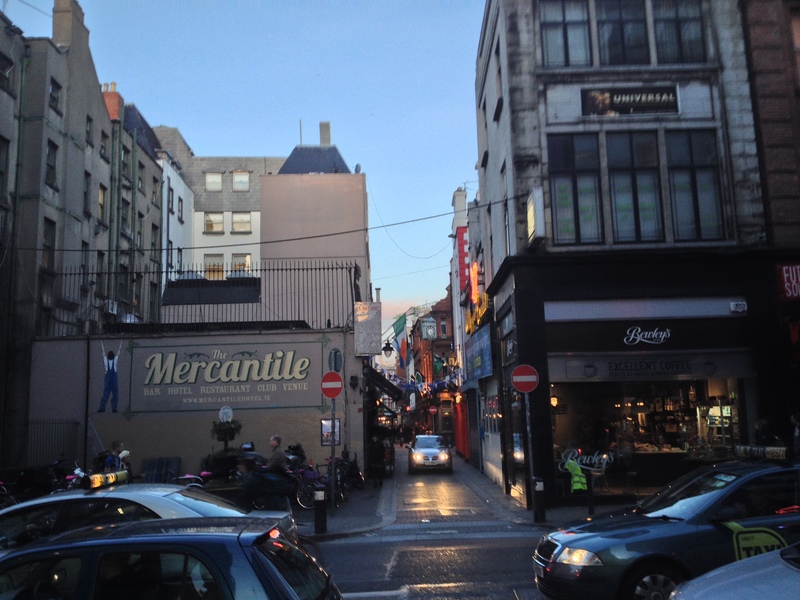 … then winding up admiring the graffiti, sticker art, and the mystery letter box on Dame Lane West, below. But as you see above, and as all Dubliners know, Dame Street crosses busy Georges Street, and continues as you see above running east. Across the river of traffic, on the side of a building, you can just make out above, the glow of neon light. See it? 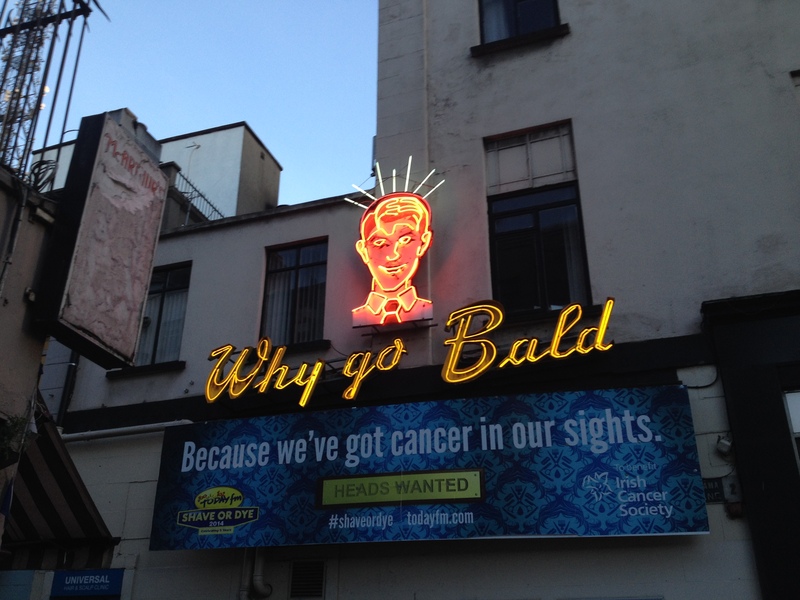 This of course, is the legendary Why Go Bald sign, a venerable and iconic piece of Dublin advertising neon, installed many decades ago as an advert by the Universal Hair Company as a sign for their premises within. By the early decades of this century it had fallen into a sorry state of disrepair, with lights missing and dead. But the activism of design historian Lisa Godson and others of the 20th Century Trust brought this wonderful piece of neon art back to life. They found the original plans and drawings i the company who had first made it, Taylor Signs, an old Dublin firm, and Taylor, to their ever lasting credit, agreed to help and remake the missing sections and the necessary repairs. Today and for the last 15+ years the sign has been returned to its former, lustrous beauty. Let’s cross Georges St, and have a closer look. 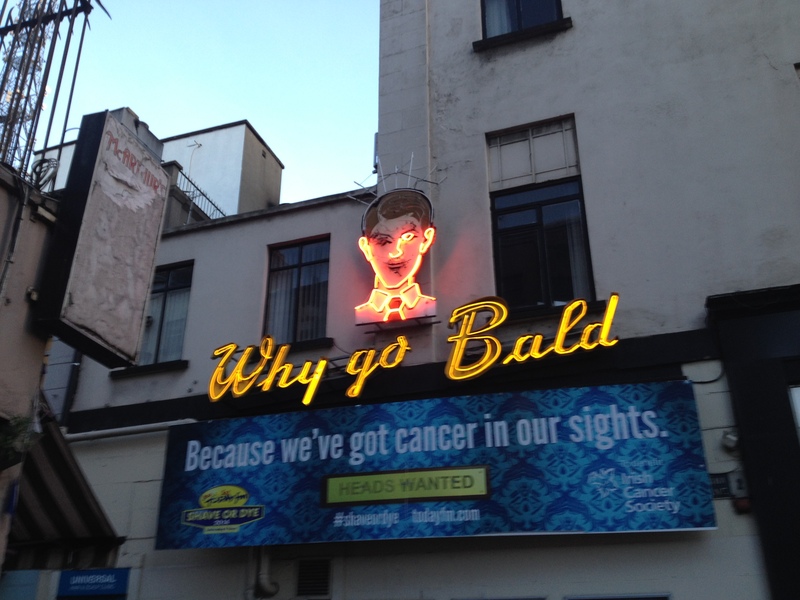 As you stand and admire the Why Go Bald sign, one of the things that strikes you is that is in fact a piece of narrative, with a neat and tidy Three-Act structure that William Shakespeare himself would have been proud of. Take exhibit-A, above. Here is our hero, relatively un-illuminated, quietly minding his own business in fact, with a full head of hair. Little does he know the horror that is awaiting him. Yes, that white arc of neon line appears, shockingly revealing the bane of men’s middle-life. Hair Loss. His left eyebrow seems to raise up, as if in horror and disbelief, as the implications sink in. But what can he do? Can he in fact, do anything? But wait, help is at hand, fro the good offices of the Universal hair and scalp clinic just within this very building. In the Third Act, as seen above, order, and indeed Hair, has been restored. A full mane of glorious follicles shines out brightly into the evening sky. Hair has been restored, confidence has been restored and the world is set right again. 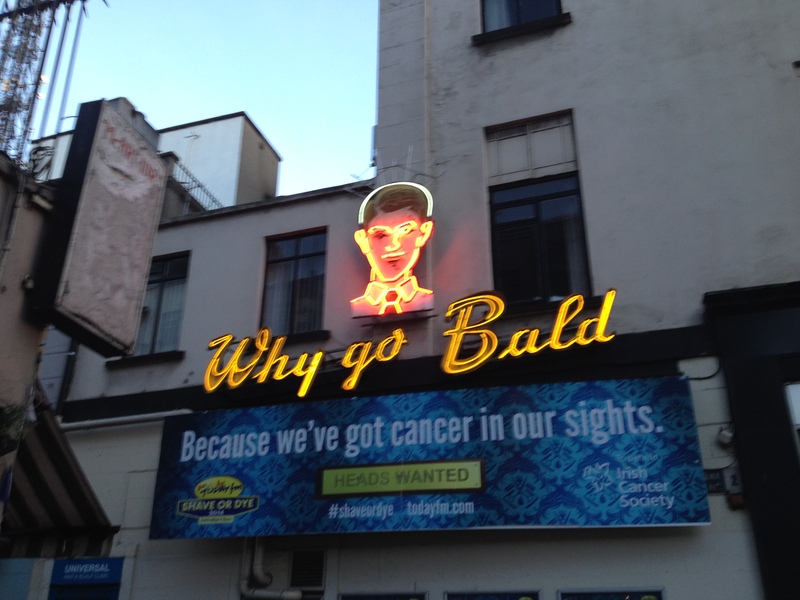 And the sign asks loud and bald, i mean bold, that eternal question, Why Go Bald? When i first started writing and researching about Dublin’s architecture and design heritage many years ago, a series called Hidden Dublin, for the first issues of local paper Totally Dublin, this is one of the first items I covered, with photography by Con O’Donnoghue and design by James Kelleher. Ever since, and in common with many other Dubliners, I love this sign. 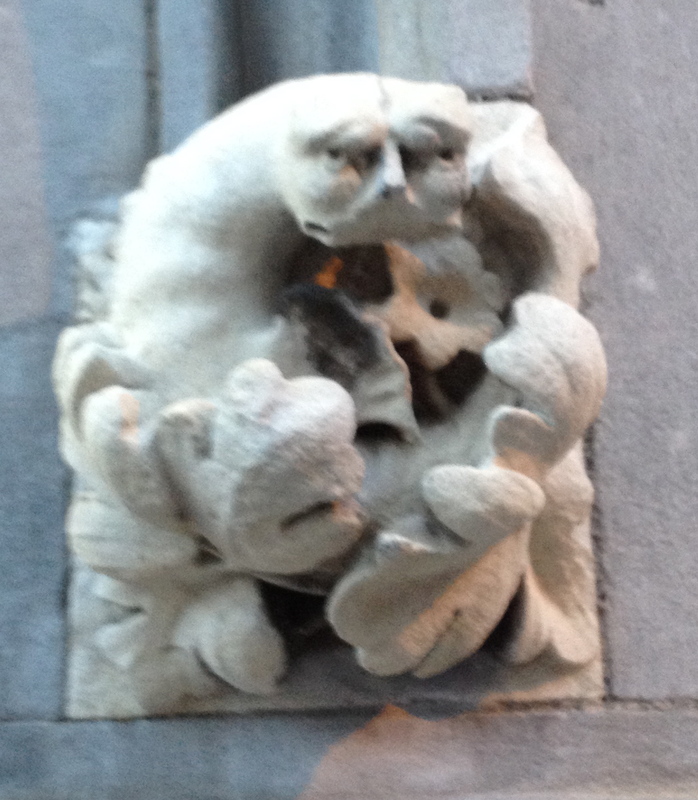 Its just one of a million objects and details that make Dublin Dublin, just one of million things we need to protect and cherish, a duty that neither we, nor our representatives, (national or municipal) succeed in doing. hats off to the 20th century Trust, and everyone keeping an eye out for Dublin. A city that can not protect itself. I’ll have a look at uploading the original Hidden Dublin article in the next fee days. In the meanwhile, thanks for reading. Feel free to subscribe, comment or share. 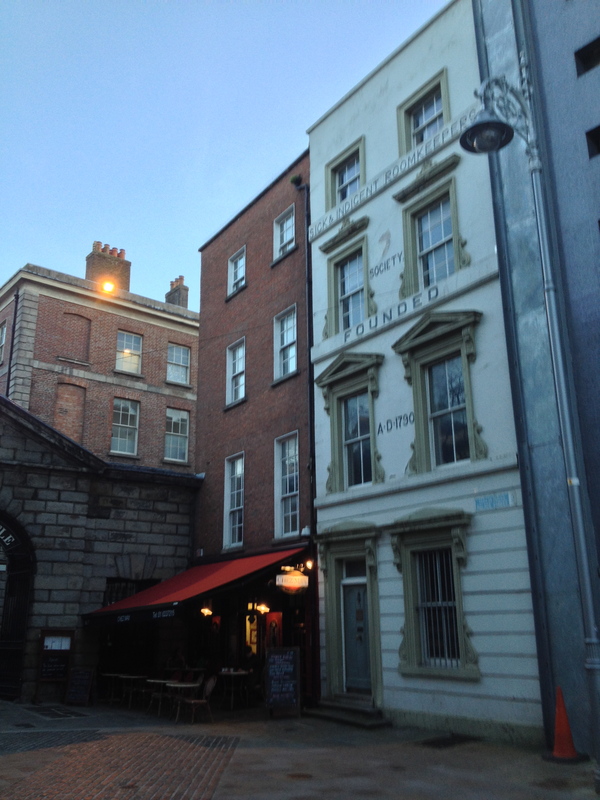 If you would like to book or join one of our unique, sociable and highly informative tours, go to Dublin Decoded to see the tour menu and then hit an individual “tile:” to see more information on individual tours and tour dates. If you’d like notifications of any of our scheduled tours, to which everyone is welcome, the best strategy is to Like and follow the Dublin Decoded Facebook page where we announce all up-coming walks and tours. best regards and thanks for reading. -Arran. It’s great when characterful idiosyncracies like these are restored, Arran. I posted an item about an unusual Bristol clockface on my http://MyNewShy.wordpress.com blog recently which was lovingly restored in 1990s. Agree with all you say absolutely about philanthropy and municipal responsibilty. Thanks for appreciation too! Love this sign… it’s up there with the Happy Ring House on the other side of the river! Yep, two absolute classics ! The Happy Ring House, also, is immortal. Has romance going for it too of course, byGawd! Previous Post Palace Street, Graffiti and drop box mystery post box. Next Post Lies, Myths (and television) about the First World War.